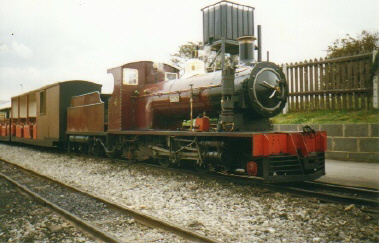 "In May 1998, "Si�n" was delivered to the Kirklees Light Railway, near Huddersfield, for the "Friends of Thomas" weekends in June and July. This railway was ideal for this design of loco, where 5 coach trains were easily hauled along the 4 mile line. Unfortunately, the boiler developed badly leaking tubes, and failed on the 26th of July. An inspection revealed that further work was required to bring the boiler into a satisfactory condition, including a new front tubeplate. The boiler would have had to be removed in November that year in any case, when its seven yearly insurance certificate expired. It was decided to start the major overhaul straight away, so the loco was taken back to the "group headquarters" in Ravenglass. With an 18 month period to do the overhaul, no stone was left unturned. The boiler was stripped down and new tubeplates made for both ends. The chassis was completely overhauled, with new bearings, pins and bushes. Some astonishing faults were found, such as the driving axle quartering was nearly 3� out on the rear axle and the left hand valve gear was only travelling 75% the distance of the right hand side! After such a major overhaul, there were surprisingly few teething troubles, but a leaking dome flange meant that the "in steam" boiler inspection had to be delayed 4 days. "Si�n's" first passenger train was hauled on the 27th of April 2000 at Ravenglass. "Si�n" attended galas at Ravenglass from Easter to May Day and the R.H.& D.R. on May 14th. "Si�n" spent summer 2000 at Windmill Animal Farm. In 2001, she attended the same galas, plus a weekend at Cleethorpes for Spring Bank holiday and also visited Romney in 2002 and the Bure Valley Railway in 2005. Si�n now spends most of her time at Windmill Animal Farm, being run on summer weekends and special occasions. Driver experience courses are also available and it is hoped that "Si�n" will visit other railway in the near future. We believe that the thousands of pounds and thousands of man hours spent restoring "Si�n" has been worthwhile, and she can now be maintained in first class condition. The loco was still serviceable, so in 1995 and 1996, "Si�n" was hired to the Cleethorpes Coast Light Railway. Earning money in the summer season, the overhauls would take place in the winter months, using all the money earned plus extra from group members pockets. It was a difficult time, as no sooner had one repair been effected, then something else would break. By April 1997, the locomotive was now beginning to resemble the "Si�n" that originally appeared in 1963. 1997 was also spent at Cleethorpes, however no agreement could be made for the 1998 season. "Si�n" had to find a new home. 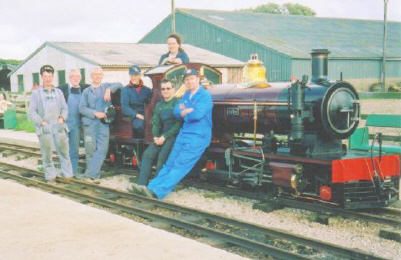 < In September 2001, seven of the owners are seen at Windmill Animal Farm, enjoying running their loco. On days like this, Si�n is particularly well turned out as there are many hands to do the cleaning!